Congratulations to this year’s Husky Green Award winners from Program on the Environment, Frieda Cohan and Beth Wheat! 2018 Husky Green Award winners Frieda Cohan and Elizabeth Wheat. This year, our program is thrilled to spotlight these two enthusiastic leaders who are walking the walk on sustainability, through environmental stewardship of green space and gardens and heartfelt teaching. 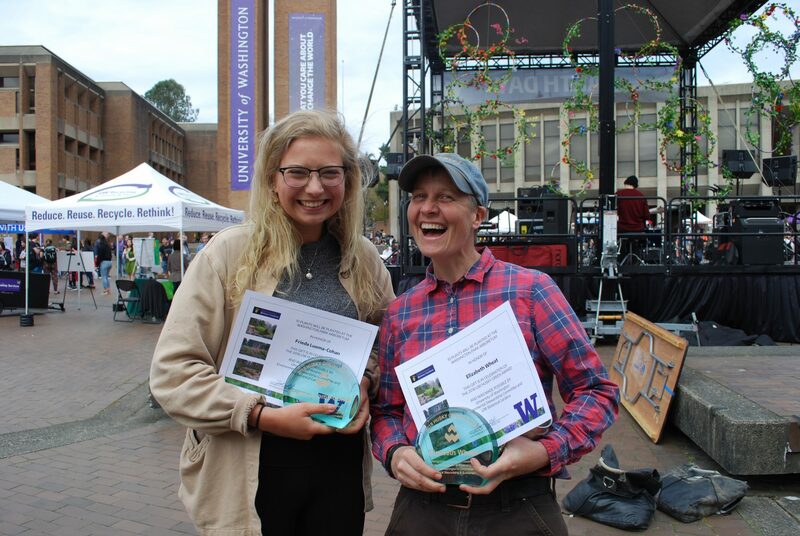 The 2018 Husky Green Awards recipients were honored on April 20 on Red Square as part of UW Earth Day celebrations. 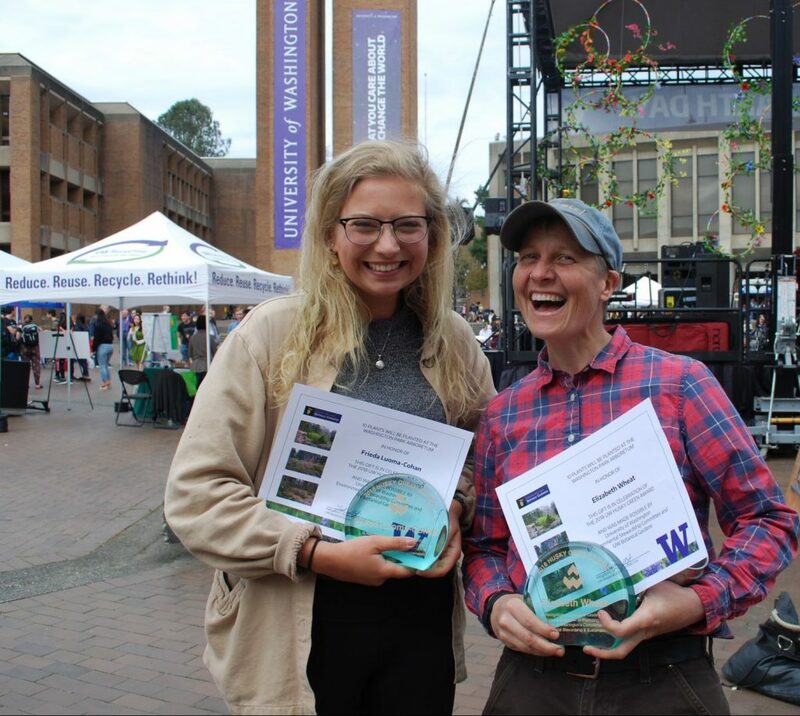 The awards are in their ninth year of recognizing leaders on the UW campus who demonstrate their dedication to the environment. Frieda is an Environmental Studies major and plays an active role in the community. 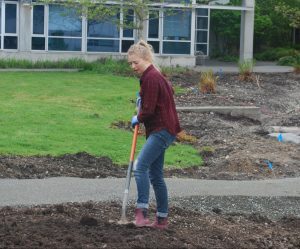 She took part in an independent study garden build project last year to help design the program’s Sustainable Learning Space, a recently restored garden space dedicated for outdoor learning. She took on the role of garden steward, helping to maintain the space by clearing the trails and planting native species. Frieda recently returned from Spring at Sea, where she spent three weeks aboard the R/V Revelle learning about oceanography and feeding her passion for marine conservation. As part of her leadership on campus, Frieda is co-president of SAGE (the Student Association for Green Environments), and co-organizes activities and events such as last year’s Art to Inspire, a group effort to gather the UW community to celebrate art as a vehicle for raising environmental awareness. Frieda digging up some dirt during the construction of the Sustainable Learning Space. She has coordinated recycling efforts at UW football games as part of her involvement with SAGE and last year UW Athletics recorded their highest waste diversion rates ever. After she graduates, Frieda will help onboard the next Sustainable Learning Space garden steward and then embark on a grand adventure to travel through SE Asia and parts of Africa, an experience made possible by her recent award as a Bonderman travel fellow. Beth at SkyRoots, her farm on Whidbey Island. 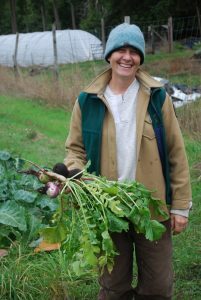 Beth is a lecturer at Program on the Environment and teaches a variety of courses, including The Urban Farm, Attaining a Sustainable Society, Introduction to Environmental Studies and Agro-ecology of Cascadia. Awarded the UW’s Excellence in Teaching Award in 2010, Beth exudes passion and inspires students to mindfully navigate the world when making decisions that impact others. Beth’s interest in agriculture grew after working on the UW Farm as a graduate student and today she sits on the board of the Farm and frequently takes her class onto the farm at UW, to increase students’ awareness around sustainable urban agriculture. 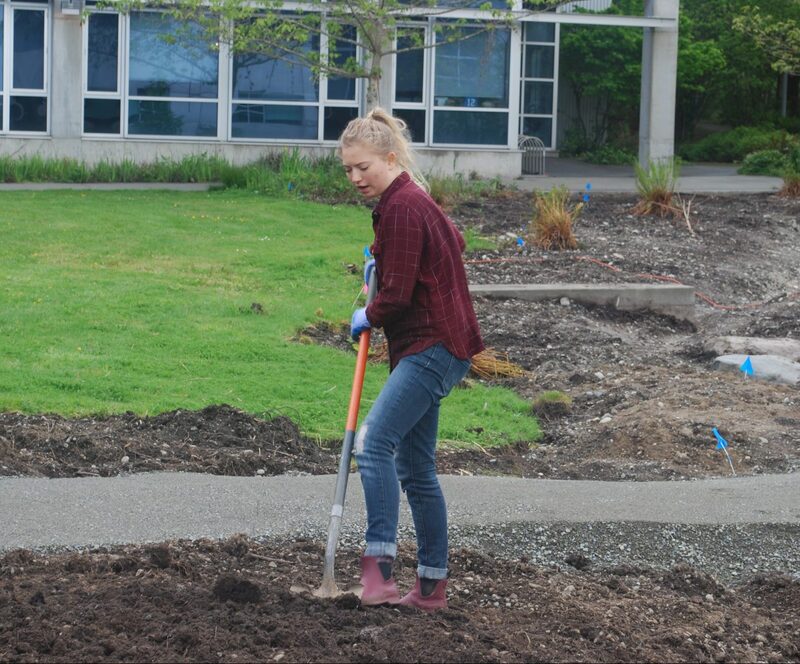 She also takes students to her own farm, SkyRoots, on Whidbey Island, to demonstrate how small-scale integrated farms can provide sustenance, while giving back to the earth and to the farmers. A shared meal and laughter always follows. Read more about Beth’s teaching path and love for sustainable agriculture on the Whole U Faculty Friday spotlight.